If you are in any type of service based business (professional, creative or trades) your personal brand is truly the jewel in your marketing crown. So it’s crucial to get your personal brand in order before all other marketing. Prior to investing and diving into a website, digital campaigns, PR, social media and marketing activities spend the time to unpack, craft and communicate your personal brand proposition. Not doing so can really compromise success and ROI of other marketing efforts in the short and long term. Everyone has a personal brand to leverage and is fundamental to reputation and growth. And in today’s digital world it holds even greater relevance as it’s often the only way to differentiate a business in noisy competitive sectors. The impact of your personal brand will have a negative or positive effect on the clients, suppliers and staff you want to attract. But if done well and authentically it will amplify and strengthen the greater business and marketing objectives. We are saturated with content, digital overwhelm and social media fatigue. This has further driven the need to focus on personal branding to stand out, be relatable, credible and likeable. Consumers have so much choice. And with that choice comes confusion in a sea of blandness and vacuous cliché promises. Service businesses are grappling and vying for a chunk of their market pie. And a chunk that is profitable and sustainable. And inundated with pop culture expectations to become a thought leader or major influencer it has become tiresome and inappropriate for many. These labels are terribly overused and misused creating a great deal of angst and branding denial. Misunderstanding and misuse often leads to hesitation and fear which results in badly executed branding or worse, none at all. 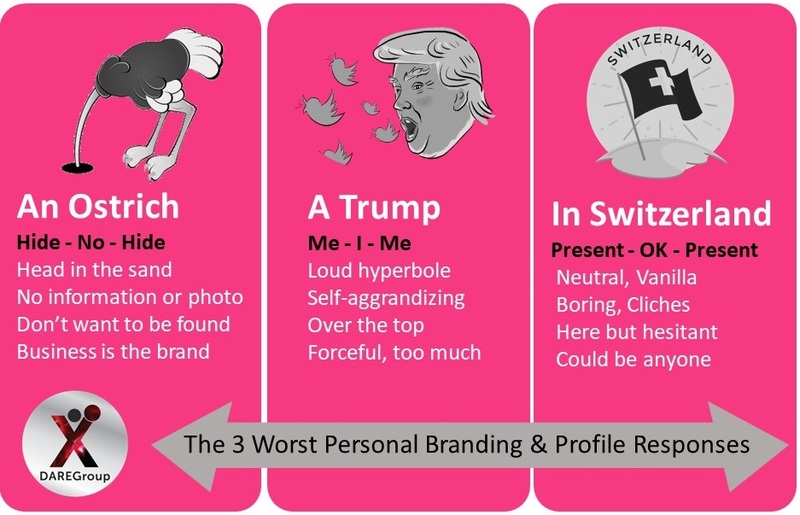 From observations and analysis circa 60% of all people respond to the challenge of a personal branding and how they show up (on LinkedIn, websites etc) in one of 3 ineffective ways. They can either be an Ostrich, a Trump or a Switzerland. People buy from those they Know-Like-Trust. So accepting the Know-Like-Trust model and that invariably 8+ touch points are required before a prospect engages (especially in service sectors) it makes total sense to undertake personal branding and positioning BEFORE all other marketing and digital activities. Your personal brand on your website, LinkedIn profile or other social media must be inspiring, engaging and a base of trust and value. You need to step up and out and be the best version of the real you. An Ostrich, Trump or a Switzerland won’t do you any favours or bode well. You need to stand for something and show who you really are. Hold your purpose around a centrepiece of pride and the value you offer. Your personal brand and market authority has to be authentic. But truly it is the jewel in the crown that will differentiate you and your business. Everyone scrambles to ‘be ‘the best’ in their sector. But ‘being different’ is actually more powerful and can be woven intuitively into communications cleverly. It’s a balancing act but one that is really a core part of growth strategy. If you are an established service business no doubt you will have embarked on a range of marketing activities. So the horse has bolted. But if you’re personal brand isn’t a clear inspiring magnet you should rectify that urgently. If it is – fabulous you will be seeing a good ROI on effort and spend. And if you are about to launch or re-brand your service business get crystal clear on your personal Who, What, Where & Why to get off to the best start. Get your personal brand in order and all other marketing activities will benefit.